I’ve become interesting in how forking content could help OER. 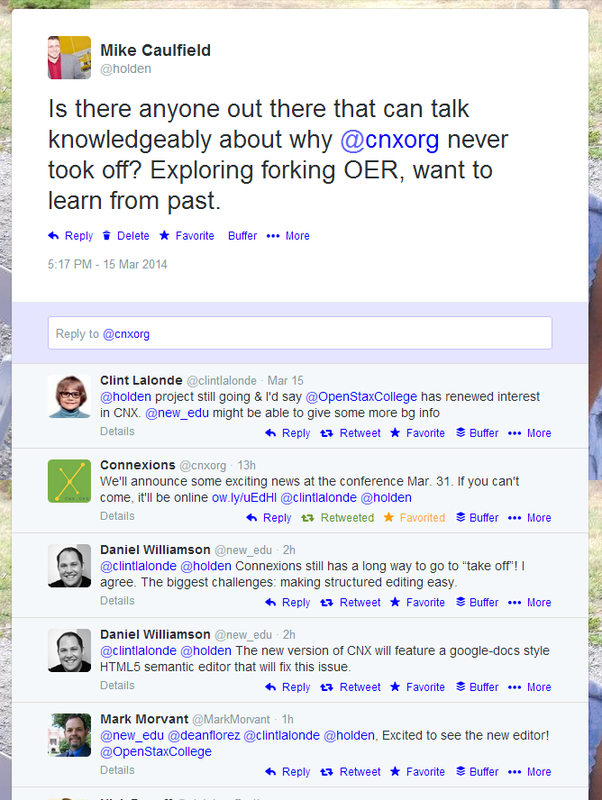 The two big experiments in OER forking I know of come from WikiEducator and Connexions. (There may be others I’m forgetting; you can correct me in the comments). Connexions, in particular, has been looking at this issue for a very long time. One note about OER — this editing thing has always been a bear of a problem. You want editing to be easy for people, which means WYSIWYG. At the same time, since content has to be ported into multiple contexts you want markup to be semantic. Semantic and WYSIWYG have traditionally been oil and water, and so you end up either with a low bar to entry and documents that are a pain to repurpose or portable documents that no one can really edit without a mini-course. There’s multiple ways to deal with this (including just giving up on module level reuse entirely), but I’m interested to see the new editor. We have invested far too little money in the tools to do this right. Also – how much of this is text dependent? Maybe I want to mess with audio and video. US OER is *obsessed* with cheap school books. Pat — that’s a great point about audio and video. Although I think the “textbook” in whatever form is still the architecture that will link much of that together. I know when we look at the fedwiki project we’re struggling with what forking means with the media assets. I’d worry it isolates people. After OpenEd12, I didn’t really know what to do with OER as I felt it had become textbook only (and indirectly that the arguments for OER had become economic, not social or creative). When people say “OER saves money”, I wonder what they mean – do they mean less taxes? Would “OER help us spend money on the best education we can provide” not sound a little better? Forking is great, but has the term come about because OER people see github and go green with envy? Forking suits text, and effectively it is remixing for text (but also a handy way to edit a shared document). Remixing has always been some sort of holy grail, but the OER topology is sans tools, and we sort of expected people to just go and do it? I never bought into the 4/5 Rs, because deep down if you share, what does it matter what people do with it? Forking for audio – multi track recording sessions – people adding in their own bits and merging or removing, shared editing – maybe it needs to have a tracks like model (which text would lack). Same as pictures maybe? Am going to make some OER tools now for audio and video now….